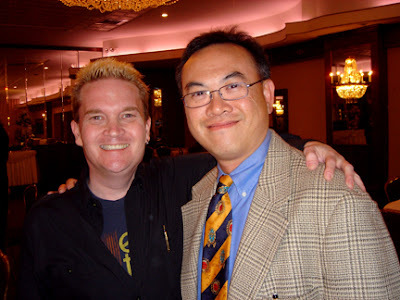 Terry Chan Photography: 25th High School Reunion! Today, I arrived in NYC at 12:30AM at JFK airport. I stayed at the American Airlines Admiral Club and cleaned up at their shower facilities. I then quickly took the Airport Shuttle to my Hotel in Queens. Since I couldn't check in yet, thankfully I was able to store my luggage temporarily at the Hotel. I quickly took the subway to Brooklyn Tech because it's my 25th High School Reunion! I was a little late but I made it to my graduation class slideshow presentation. I was glad to found my best buddies from high school Ty and Robert. They saved a seat for me in the auditorium where we graduated 25 years ago. It brought back many memories as I walked up the block and into the entrance of the school. Those were the same steps I took 30 years ago when I walked in as a freshman. We then went to lunch at the cafeteria on the 7th Floor. One of us decided to walk though memory lane walk up the stairs just like we did when we were young. Young is the operant word here because most of us were huffing and puffing after 3 flights of stairs. I was thoroughly tired from walking up those tiny little stairs. When we arrived to the cafeteria, we were very very winded. :-) I guess after 25 years, we're all pretty out of shape. I gotta hit the stairmaster when I get home. 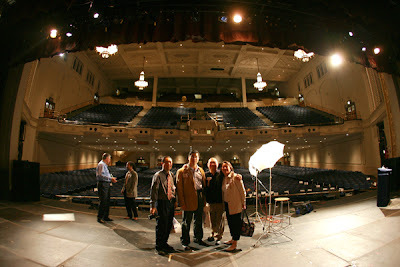 Here's a photo of the enormous auditorium at Brooklyn Tech. I remember local college and universities used to rent our auditorium for their graduation commencement. It's a fisheye 15mm Canon L lens. 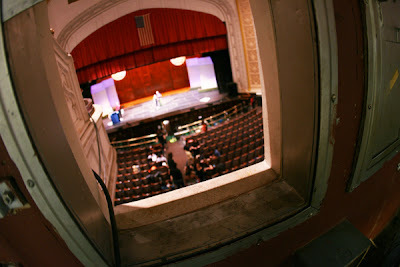 This lens creates an even greater grandeur of the the auditorium. 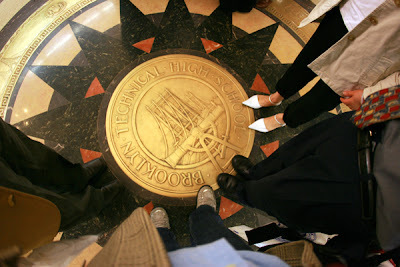 Here's a picture of all of our feet on the Tech Shield on the first floor lobby of the school. I know to most untrained eyes, this looks like a boring window. It's actually the window Tayen and I photographed through many graduations and stage performances such as the local ballet. It used to be so hot in there in middle of June where we only had one fan blowing in the tiny projector room. 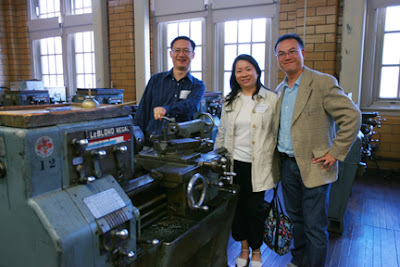 Here's the famous lathe that we all used to make a ball-peen hammer, plumb-bob in our metal workshop. I particularly like my metal shop because it was during my sophmore year 1980 when we had a subway strike. I actually carpooled with my Dad to Manhattan and then walked across the Brooklyn Bridge to school just so that I can attend my metal shop class. By the way, I got an A in all my projects in metal shop. :-D The other shop class was Foundry and we sadly found out that it's been scrapped permanently. Current students no longer require to take that class. 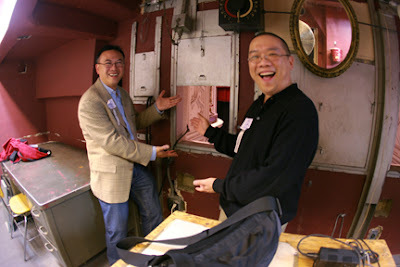 It was kind of cool building mold and pouring molten metal to make our metal devices. Too bad it's now gone forever. On thing for sure change is a constant, it cannot be stopped. After the tour of most of the school and to the GO store. I bought a couple of T-shirts that we used to wear for gym. We went back downstairs to the Gymnasium for a group photo. Here's a picture of David Milman and me. We were pretty good friends when we were in high school. He was exceptionally short 4'10" and had cubby cheeks. In short he looked like he was 12 and many of the students picked on him. I on the other hand felt everyone was mean. By the way, like me he grew several inches taller after high school. It's funny how everyone grow in height at different time of one's life. He and I were the shortest people in our graduating class. About 5 years ago we hooked up via the Internet when I sought him out via Classmates.com. He now owns a computer consulting franchise that similar to Geek Squad. Doing extremely well. So here's to all the people who picked on him. 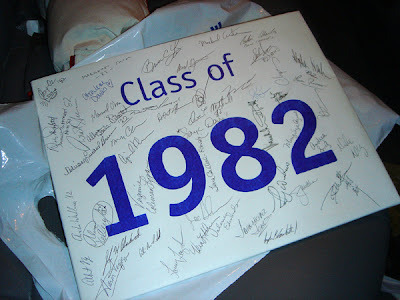 Below is a signed Class of '82 placard used for the group picture. My signature is on the bottom right hand corner with my Chinese name. This placard is now in the possession of David Milman. It's definitely a great memorabilia for our graduating class. I managed to photograph it right before he went home after the dinner banquet. Finally here's a photo of me and the organizer. She used to be a cheerleader and we had nothing in common. 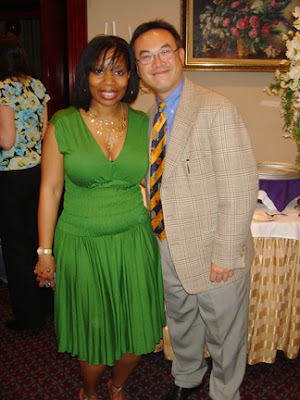 In fact, we never spoke to each other even though she was in several of my class during my 4 years at Tech. She has not aged at all even though she's a mom, and over 40 years of age. That's the beauty of reunion is that after 25 years, we find kinship and camaraderie through a commonality which is Tech. 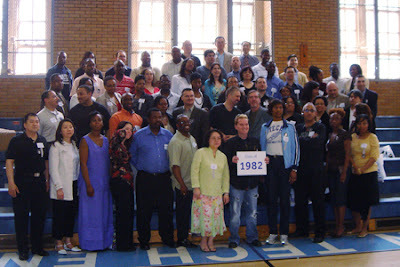 Who would have thought 25 years later we would stand shoulder to shoulder for a photo. It's been an amazing experience. And realistically, it will probably be my last reunion because no one really goes after 25 years.. perhaps 50th year but I would be pretty old... perhaps too old to travel to NYC. I wish more of my classmates were there. I really missed some of them and wonder what they are doing now. I definitely recommend anyone to go to their own reunion. It's definitely one of the highlights of my life to be there meeting old and new friends.